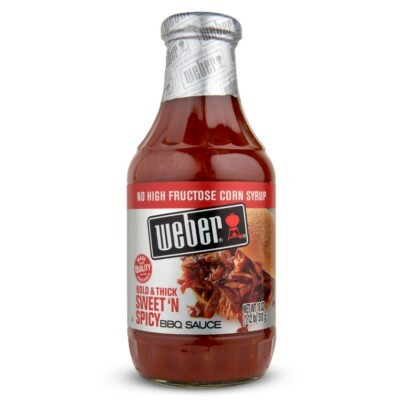 From the award-winning Weber Grill restaurant chain in Mid-America, Weber Sweet n' Spicy barbecue sauce will bring a delicious dose of sweet and heat to your ribs, pulled pork, steak, sausages, sandwiches, hamburgers, and more! Made without high fructose corn syrup, this unique condiment features a gorgeous blend of spices mixed together with molasses and red pepper for a barbecue experience you'll never forget. Water, tomato paste, sugar, vinegar, salt, modified food starch, molasses, red pepper, spices, natural hickory smoke flavor, color E150, thickening agent E415, garlic, onion. Contains GMO. Nutrition facts (for 100g): calories 132Kcal, total fat 0g (saturated fat 0g), total carbohydrate 32.4g (sugar 29.4g), protein 0g, salt 1.7g.